Companies spend an immense amount of time and money on recruiting, and often don’t get the results they were looking for. 66% of candidates want to hear more from employees. Candidates are twice as likely to accept cold emails if they have interacted with your brand before. It takes an average of 27 business days to make a new hire. The best candidates are off the market within 10 days. 64% of applicants would share negative application experiences with friends and family. …and 27% would actively discourage others from applying. 60% of candidates have quit a too long application process. 15% of candidates with positive hiring experience put more effort into the job. Over 75% of professionals are passive candidates. 46% of recruiters see “recruiting becoming more like marketing”. Employee turnover can be reduced by 28% by investing in employer brand. 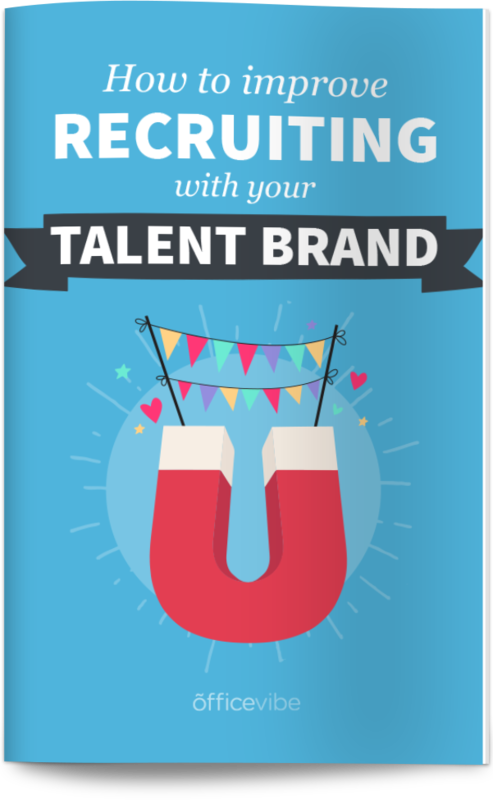 Free Bonus: Download our free eBook with tips and tricks for improving recruiting with your talent brand. In the past, companies could advertise whatever image they wanted to potential candidates, but today, candidates prefer to learn about the company by interacting with people who work there. Websites like Glassdoor and of course, social media, have changed the way companies recruit because there is so much more transparency in the process. No longer can companies hide behind marketing gimmicks and buzzwords; companies need to be much more authentic, and potentially change the way they do things. The book Good Is The New Cool offers some really great insight into the importance of sincerity and realness in today’s marketing world – it’s worth a read. Get Employees Involved: Encourage employees to promote the company on their social media accounts. You can even create a company hashtag to help create a culture. At GSOFT, ours is #yesimatwork. No one likes getting cold emails unless they’re really well-written or from a well-known company. As a simple example, if you were to get a cold email from Google offering you a job, it’s likely that you’d open it. Right? That’s why developing your employer brand is so important. Whether it be via social media or word of mouth. Simple Tips For Effective Cold Emails: Be human – personalize every email and don’t be afraid to show some personality. Real people are more interesting than automated messages. You can also send a private Linkedin message, which humanizes the process even further because they can put a face to the name and browse your profile. Companies realize the value in taking the time to get to know someone and the importance of having all potential candidates go through multiple steps in the interview process before making a decision. The only caveat to this is that top talent is off the market very quickly. Often, companies will overdo the process and make it longer than it needs to be. Optimize Your Recruiting Process: There are tons of excellent software options that help to optimize the process, such as Greenhouse, used by companies like Pinterest and Evernote. Take advantage of all the great resources available. The best candidates may already have several offers coming their way, quickly. so if you find a top talent candidate, you should try to move fast. You want all-star players on your team, and you need to do whatever it takes to get them. How To Secure Top Talent: You need to find the “just right” scenario of recruitment, meaning, don’t make the hiring process too long and complicated that it becomes daunting to the candidate. But, don’t make it too simple either, making the position less ‘exclusive’ and desirable. This is a pretty alarming statistic. What it takes to recruit an employee has changed because the opportunity cost of hiring the wrong employee is too much of a loss. Recruiters now administer more advanced tests, bring other managers into the process and spend on more expensive and diverse job listings. Don’t Forget To Consider This: Make your money count. Your candidate may have great experience and be a good fit on paper, but do their values and personality fit with the company culture? If not, you might want to reconsider the hire. Think about the lost revenue from missed business, the lost money from employees who have to do more with less, the money from mistakes made when employees are doing too much to handle, etc. This is a constant, arguably unnecessary stress for employers. Focus On Building Your Employer Brand: This is crucial to reeling in top talent. It isn’t an overnight process but it’s one that can’t be ignored. SparkHire gives some great insight into employer brand techniques. The candidate experience is so important, and companies can’t ignore this process because your reputation is at stake. One bad candidate experience might seem trivial, but with inevitable word of mouth and today’s prolific use of social media, there can be residual effects that leave an indelible bad image on your company on more than just one person. Be Respectful: If you decide not to hire a candidate, be sure to send them an email or give them a call to let them know that they haven’t been accepted. And to kick it up a notch, if they happen to ask for a reason, taking the time to share your insights would be so greatly appreciated. This is a big opportunity wasted, and you risk losing great candidates because your process isn’t well optimized. Google is a good example. They realized that after working so hard to optimize the hiring process, they had too many steps in the interview process, and therefore brought the number down to 4. Now they’re able to get candidates through the door much faster. Something To Think About: Just like an author can revise and edit their book an infinite amount of times, sometimes you just have to decide to be done. Don’t overdo the process. Nothing is ever completely perfect, and you won’t know if it’s really a great fit until you try. It’s so important to make candidates feel good and respected at every point in the process. When this is the case, the employee will already hold your company in high regard, enticing them go the extra mile to make your company successful. How To Make It Positive: Just as you expect candidates to show up on time, you should likewise be punctual – show up or call when you say you will. And, try not to schedule any portion of the interview over the weekend (even if it’s on the phone), demonstrating the company’s respect for work-life balance. Many companies make the mistake of neglecting passive candidates. You’re missing out on a giant pool of talent that would potentially be willing to work with you if the offer was right. Keep This In Mind: Don’t view hiring as a one-time thing when you need to fill a position. Building and maintaining your employer brand is an ongoing process that takes input from many different people in different departments. Recruiting is becoming more and more like marketing. Candidates, both passive and active, should be treated like leads in a funnel, the same way that marketing treats their leads. How To Attract Leads: Message people of interest with relevant content (blog posts, company news, etc.) at the right moment. HR can work alongside marketing teams to optimize the process. If there’s one key takeaway from this post that keeps repeating itself, it is that your employer brand is crucial. Employee turnover is costly, so doing whatever you can to reduce it is essential. The entire experience from A-Z (hiring to onboarding and onwared) needs to be seamless so that employees are excited about working for your company right off the bat. An Example To Lead By: Hubspot, a company famous for their culture, makes each new employee responsible for improving the onboarding experience after they go through it, giving even the newest of employees an important task. Do you have any recruiting tips and tricks to share?